Edit the Folder Thumbnail Preview. Brand your folders to display the contents. Note: this is a Admin function. 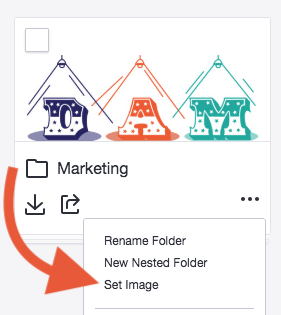 You can manually change the image that is shown as the the thumbnail of a folder. The image must reside in that folder. Hover over the folder you wish to update the thumbnail. Click the ellipses (...) to bring up the pop up menu. Select the image from the folder you wish to be displayed as the thumbnail. Resize and position the image how you like. Click Save to update the thumbnail.